Beam Type: Knowing the beam type of what you intend to lift is essential so the trolley of the chain hoist rolls and operates properly. Common types include the I-beam, WF-beam, or Patented Track beam. Cable Length of Pendant Control: This is the length in feet for how far you prefer the hand control to hang in relation to the position of the chain hoist. Capacity: This refers to the total weight you want to lift with your hoist. Depending on the manufacturer’s specifications, you will need to round up to the nearest quarter, half, or full ton when you buy the hoist. Lift: To determine lift, you need to know where the chain from your hoist will hang from and where you will pick up the load in relation to the chain hoist’s location. Power Source: Most homes operate on single phase power while industrial organizations can use up to three phases. Check with your utility company if you’re uncertain of your current voltage. You also need to determine the control voltage you will send to the handheld pendant of the chain hoist. This is typically either 24-volt or 115-volt. Speed: Experienced chain hoist operators often have a preferred lift speed, but people new to using this equipment can benefit from professional guidance. 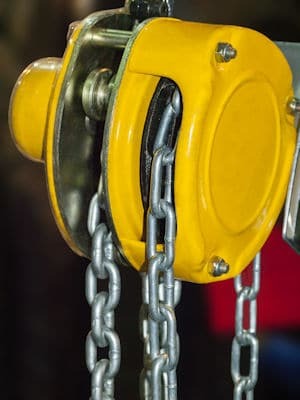 The typical chain hoist can move between 2 and 32 feet per minute. Suspension Type: Your options here include hook mount and lug suspension. With the first type, the chain hoist has a hook attached to the top of its body. Lug suspension is a good option when you’re working with limited headroom to operate and mount your hoist. Trolley Type: Chain hoists come equipped with a geared, motorized, or plain trolley. When you use a geared trolley, you pull a chain that hangs from the trolley to trigger the wheels to roll along the beam. A motorized trolley comes with a motor attached to the side of its wheels. A plain trolley, commonly called a push and pull trolley, has a hoist attached by either a lug mount or hook. Be sure to ask for help from a sales representative if you’re uncertain of how to determine any of the above factors. If completing a work project, your immediate superior should answer these questions for you before you select a chain hoist. Now that you understand the various components of chain hoists, it’s time to look at what each type offers. It’s common to need different types of hoists depending on project specifications. This type of hoist can lift loads ranging from one-quarter ton to a full ton. Its lightweight, compact features make it ideal for workstation and general commercial applications. An air chain hoist can reach lifting and lowering speeds ranging from 45 to 120 FPM. It is durable and reliable to handle a wide range of heavy-duty lifts. The air chain hoist offers multiple options for suspension and requires little maintenance over its lifespan. Lift operators find this a nice alternative when dealing with certain categories of lift loads, particularly those labeled explosion-proof. Made with an aluminum frame, this load type offers a hoistaloy load chain for the heaviest loads and a stainless-steel, spark-resistant chain for loads classified in the medium category. Its external braking system allows for easy adjustment when dealing with various types of load ranges. The built-in stops of the air chain hoist prevent you from traveling too far with both the lifting and lowering functions. You maintain accurate control of your loads by using the standard pull cord control. Some models come equipped with an optional ergonomic throttle for better pendant control. You can also request a supplemental muffler on some units to reduce the noise you produce while operating the air hoist. Yet another option you have with this type of hoist chain is whether to use a lug suspension or a hook. An electric chain hoist can handle heavy industrial loads as well as smaller personal loads. It allows you to move items quickly and efficiently, which can dramatically increase your productivity. This type of hoist is suspended from a structure or beam with a trolley mount or hook. You then lift the load with a hook that you previously attached to a chain. It operates with heavy-duty rope wire. The most common industries that use electric chain hoists include construction, material handling, mining, manufacturing, and transportation. A small electric chain hoist can lift approximately 400 pounds while the largest types can lift up to two tons. Because this type is so efficient, you can complete jobs in much less time than you could with a manual lift. It’s also rare for operators to experience muscle fatigue and strains while using an electric chain hoist or in the days afterwards. If you’re in charge of scheduling lift jobs, using this type of hoist can save you considerable money on labor costs. Many electric chain hoists feature lateral trolley movement that enables you you to lift loads both up and down and side to side. This provides you with greater versatility as well as cost savings by not having to invest in two different types of chain hoists. It produces less noise than some of the other types, although you still want to use hearing protection while operating it. With routine preventive maintenance, you can expect an electric chain hoist to last for several years. Another feature to consider with an electric hoist is the headroom used by the lift. Many compact design models can deliver heavy lifting capacities while still delivering a low headroom. Viewing the specs and a copy of the lift manual before purchasing can help you decide which low headroom hoists will meet your needs. The manual lever chain hoist is ideal when you need to move a light-duty load a short distance. Its shell is constructed from alloy steel, a material known for its strong wear resistance and superior safety performance. With this type of hoist, you have the option to employ the chain pulley and the non-return brake reducer at the same time. Its secondary spur gear transmission units are symmetrically arranged to make the lever hoist durable and easy to use. Each lever chain hoist comes complete with overload protection. When activated, this feature prevents you from attempting to lift a larger load than the equipment can safely handle. It has fully enclosed gearing that prevents debris and other types of contamination from reaching or clogging up the gears. These units have been designed as weather-resistant, making it possible to use them in all climates and weather conditions. Like the other types of hoists, the lever chain hoist operates for years with minimal repairs required. However, you should implement a regular preventive maintenance schedule to extend its lifespan as long as possible. The hoists are easy to disassemble and put back together when it’s time to perform maintenance. Its powder coating increases its durability and longevity. Using the hand chain requires you to pull the chain located on a wheel in its lifting mechanism to raise or lower the load. The lifting chain lowers or raises a load by looping with its lifting mechanism. A grab hook allows you to attach slings, a lifting chain, a load leveler, or the contents of the load. A hook located at the top of the manual chain hoist’s housing enables you to secure the hoist to a trolley system, ceiling mount, or another type of construction that can handle the weight of the load. A manual chain hoist requires no electricity to operate, which makes it easier to train new operators on how to use it. It also doesn’t require oil and is easier to maintain and repair than the other types of hoists. They typically cost less to purchase than the other types as well. However, it’s important to plan your lifts carefully since manual chain hoists are slower than other types and required more manual labor. Another thing to consider is that you can only install them in certain areas, which can put limitations on your lift jobs. This type of hoist is typically used for residential purposes, such as a Jeep top hoist or canoe storage hoist. Buying a new chain hoist is a major purchase, so it makes sense to take your time researching what will work best for you. Ask for personal recommendations from work associates, watch videos online, and even request a personal demonstration if you’re buying locally. Online reviews can be an excellent way to gauge how well the product you’re considering works for other people. The sales representative you work with should provide detailed answers to any question you ask, even if he or she needs time to research first. The manufacturer’s warranty and the company’s return policy are some other things to consider before making a final purchase. Lastly, you may want to inquire about financing options if you have any concerns about paying for the equipment upfront.